Welcome to the guide on how to make a successful guild. I’m your host, Professor Miri. I’m going to teach you everything that you need to know to make a successful guild. If you’re reading this, then chances are you already have a guild, or you’re seriously interested in making one. Anyone can make a guild, and if you’ve spent a few months in the game, you have likely seen people try to make one and fail. Making a guild is easy. Making a guild successful is the hardest thing to achieve in this game, harder than any other accomplishment in the game. If you want to have a chance in making your guild successful, this is the right guide for you. By the time we finish, hopefully you will be on your way to doing something great on Allods Online with your guild. You will learn about how to: be a good guild leader, make other people feel successful, create a stable community, make a stable culture withing your guild, and how to create an aura of excellence surrounding your guild. This guide is a constant work in progress and I’m in no way the authority on how to make a successful guild. Please feel free to share your advice on how you believe a guild can be successful — the more good advice, constructive criticism, and questions, the better I can make this guide for the community. I need to make something very clear before we get too deep into the guide: something that works for one guild might not work for all guilds. I use the experience I have with Esperanza, the guild I lead, often as an example. However, what works for Esperanza might not work for you. Every guild has different goals, visions, people, and ideas, and you might have to adjust your tactics to make this guide work for you. With that out of the way, these general principles that I’m about to give you, if applied correctly, will help you build a successful, vibrant, healthy guild that will be on its way to being successful on Allods Online, and perhaps even beyond. These are the steps you will need to take to be on the road to success. Make your guild stable. Your guild starts out dead, with only one member, and with no reputation. You have to start recruiting and set a vision for your guild. Keep people compatible. As you build up a core community, make sure new members and new officers are compatible with each other, and with your overall vision. Develop a good culture. Make sure that the culture that begins to grow in the guild is the one you want. Do great things. As Steve Jobs once said, make a dent in the universe. Help make sure people are having fun. Help your members succeed. Never look back. Make sure your focused on the goals you want to achieve. Those goals are always in front of you. Stability is a luxury that few guilds possess on Allods Online, none in abundance. Those of us who consider ourselves veterans in the game can tell you stories of dozens of successful guilds who came, climbed towards the top, and either slowly eroded away or exploded completely. Every guild loses stability eventually on Allods Online, every beginning has an end, and when that end comes, it is always because the guild could not maintain stability. To really understand how stability first, you have to see the world through the eyes of your guild members. In the real world, when someone has a job they don’t like, it takes quite a bit of effort to look for another job, be interviewed for it, and be accepted. It’s really hard to do and if you. On Allods Online, if one of your guild members does not like your guild, all they have to do is type in those six magic keys (/gquit) and they’re gone. It’s that simple. People who don’t like what you offer them can very easily move somewhere else with very little repercussions. Stability is the process where your guild builds value. You do this by building friendships, creating a positive culture, and building a good reputation of success and fun. As your stability grows, you will have more opportunity for success, and during the rough times, your guild will still survive and your members will stick with you. Especially as you’re starting out, focusing on stability will make your guild on its way to success. Easier said than done, eh? You would be correct. In fact, you’re actually competing with other guilds on your server for your own guild’s stability. The other strategies in this guide will help you become more stable, but in my opinion, the two most important factors that lead to good stability are: good recruitment and a good vision. Recruitment is the foundation of stability. A guild is only as good as the people inside it, so as a guild leader, you want to make sure you get as many good, quality people in there as possible. First, when you recruit people without having standards, these people end up conflicting with your core community — they might have incompatible personalities, different expectations, and conflicting views that will create friction in your guild. You can’t fight fires in your guild all day. Second, if you have a developed guild, you’re going to have a group of people who you will consider your "core community". These people are the people who have been with you for a while, stuck with you through thick and then, and are with you in the long haul. You really don’t want to risk losing people from your core community because they don’t like being with the bad players you have been recruiting. Third, when you do get people who aren’t compatible with your guild, they’re going to end up getting kicked or quitting eventually. When people ask them about your guild, they’re not going to represent it in a good light. The more people who leave your guild with a bad experience, the worse your reputation gets and the harder recruitment will become. How do you get good players? Well, first of all, you need a good recruitment policy. You have to look at your vision as a guild leader and the reality of Allods Online. Do you just want a place where people can chill and relax? Then you might not care about people’s levels, and you might care more about their personalities. Trying to make a raiding guild? Then you need to look for experienced players who can follow orders and have a degree of competence. Be honest with yourself and what you expect your guild to accomplish. Recruitment does not end after you invite the person to the guild. You need to help the person get to know your community and give them some time to indoctrinate into your culture. Help them integrate into your guild, but at the same time, continue to evaluate their performance and see if you made the right decision. If you made the wrong decision, correct it immediately. You’re not doing them any favors by keeping them in the guild. If good recruitment is the foundation of building your guild, a good vision is the blueprints to it. If you’re building a house without blueprints, you’re not going to get very far. Likewise, if you build a guild without making a vision, you’re fooling yourself in thinking you can get anywhere and you’ll just be spinning in circles. Take a moment and think about the most successful guild on the faction you’re in. That guild is successful because it had a vision and stuck to it. You may not agree with that vision, especially if you’re wanting to make another guild — but that vision is what got them to where they are today. Likewise, you need to know what you want to accomplish, and you need goals to get you there. When I started Esperanza, a month before I created the actual guild, I created a philosophy for the guild: I wanted to create a family of people, who work together, and through our friendship, we help each other become successful. I had to find people like-minded who were here mostly for friendship, not just for loot, but at the same time, wanted to use our mutual friendship to be successful in the game. Most people, when they think about what it takes to make a successful guild, never think about compatibility. However, compatibility is incredibly important in so many different aspects of your guild. You need to make sure, as you recruit, the new members you pull in are compatible with your core members, and your guild’s overall vision. You also want to make sure that the leaders in your guild are compatible with you and your vision. Your guild rules are the glue that binds together the compatibility of your members and your vision. People tend to work very well when they have clear expectations, and your guild rules will be crucial in setting the right tone for what you expect. Compatibility of your membership is crucial. If your membership is not compatible with one another, no matter how successful it is, it will ultimately break apart — you must work hard to make sure your guild works well as a team, no matter what kind of guild it is, and everyone can get along with one another. Compatibility starts with recruitment. As you look for new members, it’s not enough to invite people because they’re nice. You have to judge them against your guild. Many people will come to you who are friendly, hard-working, well-geared, generally solid people. However, that doesn’t guarantee that they are a right match. You have to be prepared to turn away good people who aren’t in line with your guild. For example, Esperanza has a rule that we do not allow people within the guild to exploit the game. We had a very firm policy against exploiting gems for astral layer two, for example, and we have a strong ethical belief against anyone in our guild doing that. We met some friendly people in the game who did not share our belief, so those people were not recruited. Not only do you need people with compatible personalities, but they need to be compatible with what your guild is offering. As you recruit new members, see what their aspirations are, what they expect out of guild membership, and what they see the guild doing for them. If you recruit people who have different expectations than what you have to offer them, you’ve just invited a ticking time-bomb into your guild. What your guild has to offer new members must match with what their expectations are for being in your guild. If you want your guild to run smoothly like a well-oiled machine, it is absolutely crucial that you have a competent, compatible leadership team. Think of the bridge of the USS Enterprise from Star Trek as an example. Every single person on the ship has their own special duties, and they work as a team to get their goals accomplished. They almost work like one collective entity. Your leadership team needs to be an extension of you and your vision for the guild, and able to work with you and each other to make the guild better. People generally like the idea of being in-charge, but very few people have the necessary skills to do it. Leadership is more than having the skills to give orders. It requires a certain mindset, and it takes a certain set of abilities to convince people to follow you. Very few people are going to have the traits necessary to help run a guild with you. Before selecting a new senior officer, you have to take some time and explain to them what it means to be a senior officer, what they will be responsible for, how they should solve problems, and be absolutely sure they are the right fit for a leadership position. Your guild’s culture can be your best friend or your worst enemy. There are fields of social sciences dedicated entirely on culture, and having the talent to shape your guild’s culture takes a tremendous amount of finesse as a leader. Your guild’s culture is like the Force — there is the light side, there is the dark side, and you, as a Jedi Master, may be able to master the Force to some extent, but it will destroy you and turn you into a giant robot if you’re not careful. Wikipedia has a very good definition for culture: "The set of shared attitudes, values, goals, and practices that characterizes an institution, organization, or group." Most people, when they think of a culture, they think on a large-scale level. Different countries and regions of the world have their own cultures, with their own beliefs and customs. But there’s also the small scale: your school and your workplace all have your own culture, from how people dress, to how people are expected to behave, to their goals and aspirations in these environments. Allods Online is no different than any other group, and you can see it’s culture throughout the game. Take some time to look through the forums, for example, look at how people communicate with one another. There are certain attitudes, values, goals, and practices on these forums that is unique to MMO’s and to Allods Online itself that defines this game’s community. Your guild, like every other association of people, will have its own culture. Your members will form a culture within your guild whether you like it or not. As a guild leader, you are responsible for shaping this culture into something that is compatible with your vision and your goals. Culture is a very tricky topic, and there are fields of study — like sociology — devoted to the study of it. But dammit Jim, I’m a guild leader, not a sociologist, so I’ll try to show you what I know from that perspective. I have said it in every section so far, and you know it’s coming: you must have good recruitment. You need to recruit like-minded people into your guild who have a compatible vision with yours, otherwise, they’re going to conflict with one another and you will have a toxic culture as a result. Another tool in your arsenal of how to deal with the culture of your guild is through your rules and policies. In particular, the way your guild leadership enforces those rules, and how your guild members view its leadership is instrumental in how the culture will emerge as a result. If your guild enforces rules on a whim, shows favoritism, promotes brown-nosing, and handles problems within the guild poorly, your guild membership will start to see your leadership in a poor light and the guild culture will suffer as a result. Your guild members will not have confidence in your and will no longer bring issues to the leadership, which will ultimately lead to a culture you do not want. The most powerful tool you have as a guild leader, and something I can’t teach you how to do in the guide, is your force of character and through your example. As cheesy as this sounds, your guild members will look to you and how you deal with people and situations, and if they respect you, they will look to you as an example. This is a very subtle but a very powerful aspect of leadership, and it is one that is difficult to master. One of the people who influence me and who is an excellent example in reforming an entire country’s culture was Nelson Mandela. Mandela was imprisoned for 27 years in South Africa for protesting its apartheid system of government — one that gave power to the white minority. However, he was released as the apartheid system was breaking apart, and he was later elected the country’s first post-apartheid president. As the country was getting ready for a possible civil war between whites and blacks, through Nelson Mandela’s leadership and force of character, he worked to set a culture of forgiveness and reconciliation. You have to get the right people to join your guild. Up to this point, we discussed how to keep the wrong people out, but you also need to know how to get the right people in. The only way to do this is to build up your reputation and do great things with your guild and your people. There is a reason people play online games like Allods Online. They want to be the hero. They want to accomplish something, become powerful and strong, and be recognized by other people. They want to have fun and they want to feel important. Your guild is nothing but a vehicle for people to achieve their goals in this game, and you have to recognize that in order to recruit good people. When people join your guild, they are paying you with their time, loyalty, and dedication. They are investing themselves in your vision, your members, and your guild’s future and no matter what kind of guild you have, they expect something in return. Your guild, especially if it’s a start-up, has very little value to it to anyone, and you have dozens of competitors who want your potential member to choose them instead. You have to ask yourself: Why does your guild matter? What are you doing that’s so special? What do you bring to the game? What can you offer players? Why should they join your guild and not someone else’s? I keep going back to "good recruitment and a good vision" for a reason. To get good recruits, you have to sell them a good vision. You are giving your guild members an experience and a service. You have to continue to give them excellence in all aspects and meet their expectations, or your guild will die trying. People play games to win. When we play games, we want to be the knight in shining armor, the hero who saves the princess, the dovahkin who saves Skyrim. So when someone wants to join your guild, it means they believe your guild can help them in their goal of excellence. As a guild leader, you have a responsibility to deliver on this expectation, or your guild members will be looking elsewhere. But what does winning mean in a game such as Allods Online? How do you beat the game? 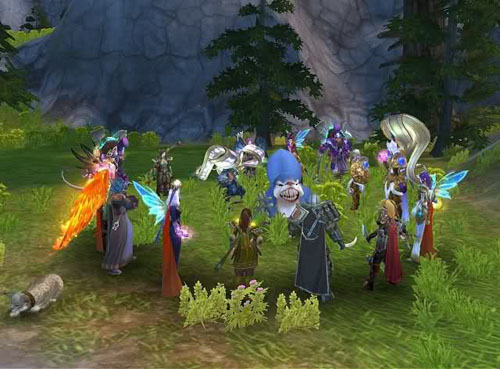 Many guilds, especially large guilds, believe that "winning" an MMO means you are the first person to complete the instance or the first person to down a certain enemy. Having a reputation for being able to succeed quickly in instances can be important, but it’s not the kind of achievement that will last and its not what most people care about. Instead of comparing yourself to other guilds, you need to focus on what you can do for your members. Guilds you compete with today can disband tomorrow. You need to focus on your guild’s vision and your goals. You have to make sure you and your leadership team especially is not only working towards your goals, but has steps to reach each specific goal. For example, if your goal is to be the best raiding guild on your server, you might want to start out with the goal of defeating Nogrom. Divide that goal in to different steps — recruiting good people, gearing members up, etc. — to the point where you have small and manageable things that you and your guild can work towards. Set up the games and events that can move your guild towards your goals. When your events do not work out, figure out why and fix the issues that come up. Don’t close your eyes and plug your ears and hope everything works out. If something does not work, figure out why, and chart another path towards success. You will find that most people in your guild do not expect success on the first try, but they do expect to see consistent progress forward towards your vision. We also play games to have fun. People do take Allods Online very seriously and many people spend thousands of hours and dollars on their character. However, the ultimate reason people play Allods Online, instead of one of the dozens of other MMO’s just like it, is because at some level, people have fun playing this game. People will only play this game as long as they have fun, and as soon as they aren’t having fun, you won’t see them much longer. A healthy, successful guild will be able to help its members have fun and get the most out of the game. Your ability to help your guild members have fun will strongly correlate to your guild’s long-term success. When people are having fun in your guild, you will find that they will be more loyal as guild members, stick with the game for longer, and with stick with you even through the darker days. One of the hardest aspects of running a successful guild is keeping you and your members from looking around, seeing all of the successful guilds, and thinking you are doing something wrong. If your guild can barely get an astral-2 party together, it’s hard not to look at another guild that can get multiple astral-3 parties out at the same time, and think you’re doing something wrong. Remember: There is no reward to "beating" the game. There is no grand prize of $100,000 for getting all mythic gear, or for beating everyone in PvP, or for completing the GT bosses. To quote the movie Peaceful Warrior, "It’s the journey, not the destination, that brings us happiness." Remember your beliefs, your principles, your values, your rules, your goals, your ideals, and your members. Do not take shortcuts in trying to race to the destination. Enjoy the journey. As your guild becomes stronger, there will be guilds doing better than you in one way or another. It can be tempting to see these other guilds and think that you’re doing something wrong. You may even lose players to these guilds, which can be very demotivating to your and your members. The way you deal with this will be your defining moment as a guild leader. Sometimes your guild will not be doing so well. Allods Online is not that big of a game, and it can be very tough at times to recruit new people. When recruitment is low, turn-over is high, and the whole guild knows it has seen better days, it can be tempting to try to lower your recruitment standards and to draw in as many warm bodies as possible. If you have learned anything from this guide, you should know that it will not help to recruit anything with a pulse. You took the time to set the standards for new members, and if you were smart about, you know these qualities you’re looking for are crucial for success for your guild’s infrastructure. Deviating from this will help in the short term but will destroy your guild later on. You think you’re good to go now that you’ve read my monstrosity of a guide? Not even close. The concepts I have laid down in this guide are merely a taste of what you need to know to become a successful guild leader. Within this book lies the secret to S.U.C.C.E.S.S. in a guild: Stability, Understanding, Compatibility, Culture, Excellence, Size, and Staying Focused. I have used this book tremendously and have lent it to all of my officers at least once. This book was the inspiration to this guide. If my guide wasn’t long enough for you, you might want to consider this book. Thank you very much everyone for giving me the opportunity to show you some of the tips I have found to being a good guild leader. Thank you very much to katjap for sharing some of your links with me! Also, thank you to everyone who took the time to read over my guide and share with me their opinions on certain issues.